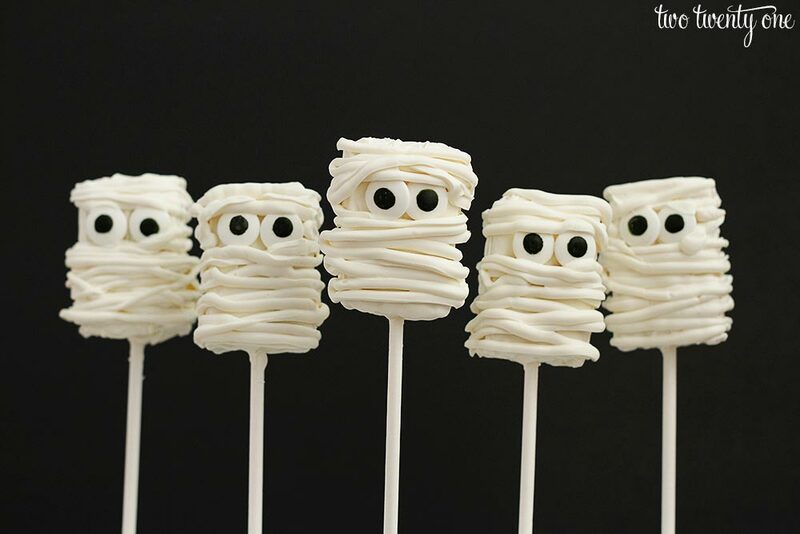 Prepare yourself for the cutest, yet still quite spooky, mummy Rice Krispies treats. The perfect Halloween treats! And I even made a quick video of myself making them. Remember, I’m attempting to land a hand modeling contract AND win an Oscar by the year’s end. After I finished editing the video, I showed it to Brad. While watching it he said, “I just can’t get over that music.” In somewhat of a panic (because I paid $$ for the royalty-free music), I said, “What? Why! ?” He replied, “Because it’s really good. And funny.” Whew! While there’s multiple steps in the process of making them, they’re fairly easy and straightforward to make. It also helps that they’re mummies so it’s best they don’t look perfect. The sticks are optional, but it’s a heck of a lot easier to dip them in and out of the candy coating when there’s a stick attached to them. 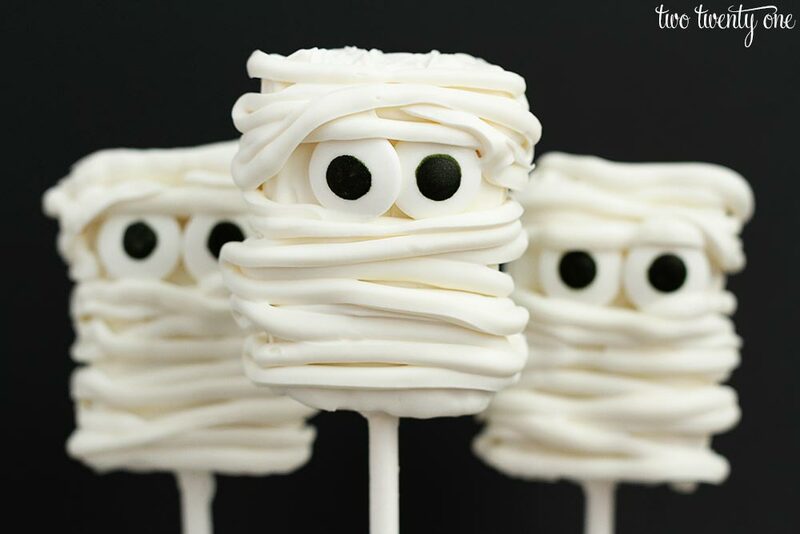 If you make these for a party, you can display them on a platter or stick them in Styrofoam. 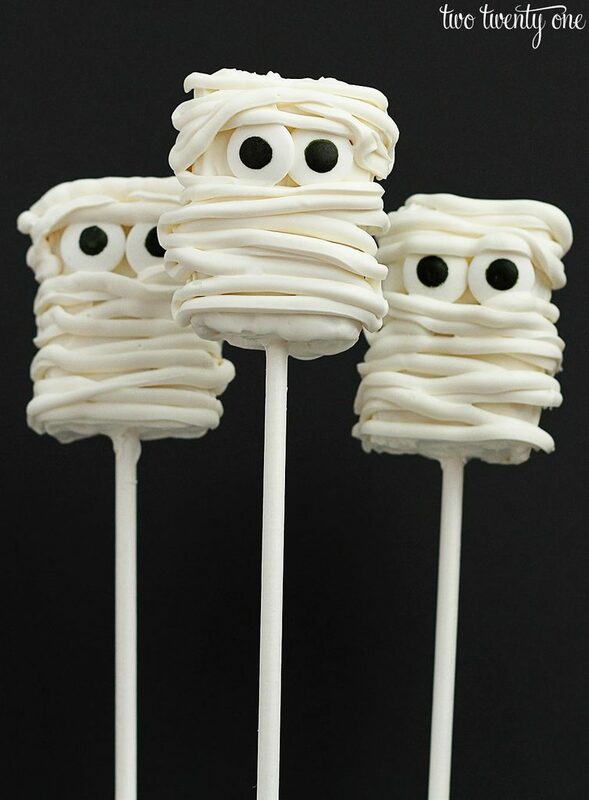 When it comes to piping the mummy wrap onto the mummies, I’ve found that a bigger hole in the piping bag looks best. 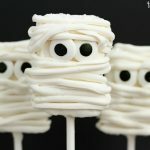 Easy to make mummy rice krispie treats! No baking required! Melt about 6-8 Candy Melt disks in a microwave-safe mug, according to the instructions on the bag. Dip the end of a lollipop stick in the Candy Melt coating and insert the stick into the Rice Krispies Treat. Coat the end with the stick with the coating. Refrigerate for 10 minutes. Fill the mug to the top with Candy Melt disks. Microwave according to the directions on the bag. Dip the Rice Krispies Treats into the coating, covering all sides. Set on wax paper. Refrigerate for 10 minutes. Fill mug with Candy Melt disks. Microwave according to the directions on the bag. Put coating into disposable candy decorating bag and snip the end of the bag with scissors. Set coated Rice Krispies Treats on wax paper. Apply small amount of coating to the backside of a candy eyeball and press onto coated Rice Krispies Treat. Repeat with other eye. Pipe coating onto entire Rice Krispies Treat in a back and forth motion to create the mummy wrap. Refrigerate for 10 minutes. I’ve partnered up with some other awesome bloggers to share some Halloween party treats. So make sure you head over to their blogs and check out their tasty creations! Those are cute! My hubby thought the music sounded like Beetlejuice! These are awesome! I love your video, spooky music and all. 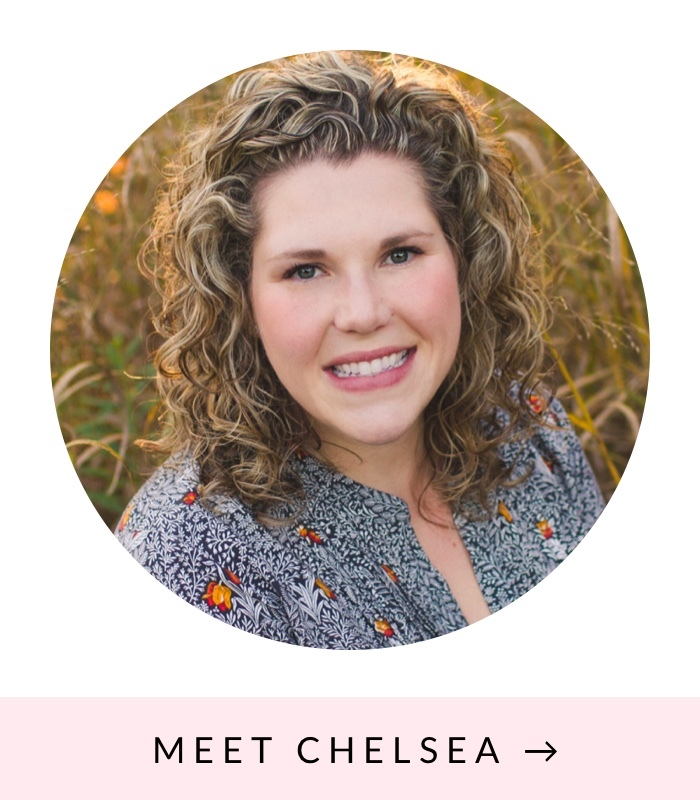 Thanks for sharing your tutorial on Motivation Monday on Mom Home Guide!